Another weak GDP number… but what excuses will they make? Did new regulations crimp home sales last month?… the dime that looks like a nail (because it is)… what might be our most controversial presentation in over two years… and more! “China would probably be broke by 2017 if it didn’t do something radical,” says Jim Rickards. We pick up this morning with a theme we touched on briefly yesterday — China’s “stealth devaluation” against the dollar this month. Rather than devaluing the yuan in one fell swoop as it did last August, it did so this month in baby steps — 10 consecutive trading days starting Dec. 4 and ending last Friday. Readers got that issue in their inboxes Nov. 20. A gentle decline was already underway… but it accelerated soon after, and the rest is history. And about those “market shocks” — the Dow tanked 800 points over those 10 trading days. Yes, there were three days of gains going into the Federal Reserve meeting last Wednesday… but they all vaporized on Thursday and Friday. 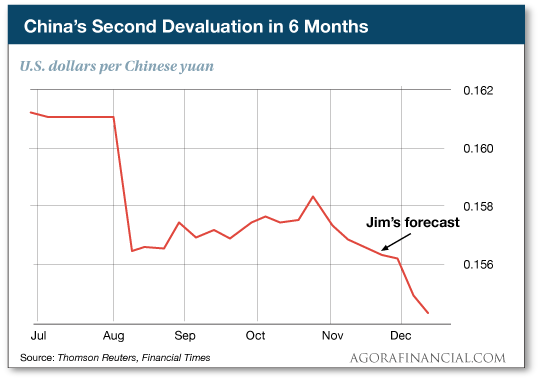 So… how did Jim see the devaluation coming? “The Impossible Trinity is a simple rule with deep implications,” says Jim. “It was first uncovered by Nobel Prize-winning economist Robert Mundell in the early 1960s. Don’t fret about exactly what those terms mean — we’ll get to that. For now, just know that a country can have as many as two of those things at the same time… but not all three. “If you try, you will fail — markets will make sure of that,” Jim says. It’s at this point we must observe the exception that proves the rule: The United States is the only country capable of pulling off the Impossible Trinity… because the U.S. doesn’t need foreign exchange. There’s your American exceptionalism for you. It works great — until it doesn’t. But that’s a story for another day. Let’s get back to China. “Until last summer, China was pursuing a version of the Impossible Trinity,” says Jim. “It pegged the yuan to the dollar at about 6.2-to-1, it had a partly open capital account and it set interest rates independently from the U.S. Federal Reserve. “At first, China’s cheap currency helped exports and led to a massive buildup of U.S. dollar reserves as China recycled its trade surpluses into U.S. Treasury notes. “But as the Fed tightened policy in 2013-15 (with the ‘taper’ of asset purchases and removal of ‘forward guidance’), China had to sell dollars and buy yuan in order to maintain the peg. Buying yuan reduces the money supply and is a form of tightening. “This tight monetary policy in China slowed down their economy and caused foreign investors to move new factories to cheaper countries such as Vietnam and Indonesia. Which brings us back to Jim’s declaration at the start of today’s episode: China had to do something “radical” or risk going broke by 2017. Something radical means giving up on the Impossible Trinity. But which of the three items on the checklist would end up being sacrificed? “Imposing capital controls was politically unacceptable,” says Jim. “China was trying to join the IMF’s world money basket (the SDR) and did not want to anger the IMF, which opposes capital controls. That left breaking the fixed exchange rate… which it did in August. “It was the only solution,” says Jim. But it wasn’t the end of the story. “Once a country breaks a fixed exchange rate, that’s rarely the end of it,” says Jim. 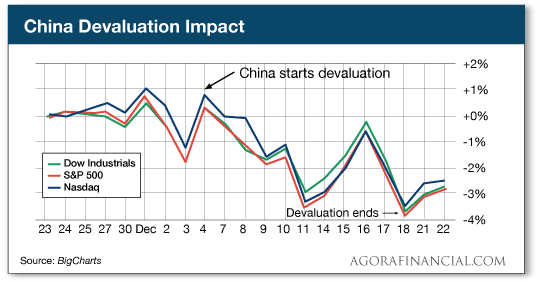 “More devaluations are usually needed. “The conditions that gave rise to the first devaluation had not changed. Capital outflows continued. (China lost another $87 billion of reserves in November). Now that China’s been admitted to the SDR, what can you expect next? Jim has just issued a brief market update the video. He’s done so only twice before this year. Each time signaled an imminent disruption to “business as usual” in the markets. This next one will be even bigger. You can watch the two-minute video right here. Stocks are rallying this morning after an up-and-down day yesterday that ended up. At last check, the S&P 500 was at 2,029 — comfortably above the 2,000 support level Jonas Elmerraji warned us about yesterday. Gold is flat at $1,076. Crude has found a bottom for the moment, a barrel of West Texas Intermediate recovering to $36.43. The big economic number of the morning is the Commerce Department’s third and final guess at GDP for the third quarter — up an annualized 2%. Weak, but it’s what the “expert consensus” was counting on. Here’s another sign the housing rally is starting to stall out: Existing home sales collapsed 10.5% between October and November. But leave it to the National Association of Realtors to put a positive spin on the numbers: The NAR chalks up the drop to the government’s “Know Before You Owe” mortgage-disclosure requirements. It’s having the effect of stretching out closing times, so we’re told this month’s number should prove to be an outlier. If it is, then the December number should be gangbusters, right? Right? “For better or worse, we all now live in CRISPR’s world,” says an article at Science magazine — pronouncing the gene-editing technology its “Breakthrough of the Year”. We spotlighted CRISPR technology earlier this month — a means of modifying genes that can be handed down from generation to generation. Barely three years old, the technology is close to 1,000 times cheaper to perform than previous methods of genetic engineering. Yes, as we said before, it’s controversial. It’s also investable. If you’re intrigued, we’ll send you a copy of venture capitalist Juan Enriquez’s book Evolving Ourselves… and give you ground-floor access to the best investing opportunities in the life sciences. Access here. In the annals of coin collecting, an error by the U.S. Mint is a rare and valuable thing — a penny struck onto the metal for a dime, a coin struck twice, that sort of thing. Was it an accident? Or was it a conscious act by someone at the U.S. Mint? Whatever the case, that someone struck a Roosevelt dime onto a sixpenny nail — the kind used for roof repair. And Heritage Auctions of New York figures it’s worth $10,000. “It is certainly the most unusual item I have had to catalog in my career,” the firm’s senior numismatist Mark Borckardt tells The Associated Press. There’s no date on the coin. All we know is the dime was struck after 1945, because Congress authorized the switch from the Mercury dime to the Roosevelt dime starting in 1946, after FDR’s death. The auction date is Jan. 6. Also included in the lot is a 1943 bronze penny. Which doesn’t sound unusual, but that’s the year the Mint made pennies out of steel to preserve copper for the war. “How you guys can play this dirty game is beyond me,” a reader scolds. The 5: Ummm…. We could be more responsive to your concerns if you specified what it is that has you so upset. But reading between the lines and noticing when your email hit our inbox, we’re guessing it’s this. Look, it’s a big, complicated, competitive landscape we face out there. One of the mantras our executive publisher Addison Wiggin laid out for us a long time ago was to “make it strange.” That is, don’t be quirky for the sake of being quirky… but by all means do something out of the ordinary if it can engage the reader’s attention. Sometimes it works, sometimes it doesn’t. The marketplace can be fickle. And the jury’s still out on this one. You can click here and help us decide whether it’s an idea worth continuing to publish. P.S. Have you heard about the one currency even more reliable than gold during a financial collapse? This form of “money” will be highly sought after when the collapse hits, as you can use it to buy just about anything you need. But… it will become increasingly difficult to find… so you should stock up now while it’s readily available. Click here for more info… and learn 330 other tips, strategies and techniques for surviving an economic collapse.